Luc Belaire Sparkling Rose Wine is a popular Sparkling Wine available from TheDrinkShop in 3lt to buy online. Visit TheDrinkShop for the best price for 3lt of Luc Belaire Sparkling Rose Wine or compare prices on our other Sparkling Wine products. A dramatically beautiful sparkling rose: a rich, vibrant pink colour. Grown and produced in Provence-Alpes-Cote d'Azur, home of the World's finest rose wines and the stunning French Riviera cities of Nice, Monaco, St-Tropez, Marseilles, Grasse and Toulon. Belaire's origins evoke the rich history and culture of the South of France: the Cannes Film Festival, Monte Carlo Grand Prix and the landscape inspiration of the impressionists Van Gogh, Matisse, Cesanne and others. A delicious, delicate blend of France's three most famous rose grapes: Syrah, Cinsault and Grenache, aged for the perfect effervessence and blended with a 100% Syrah dosage. A rich red fruit bouquet precedes an elegant palate of strawberry and blackcurrant, resulting in a perfect harmony of aroma, taste, body and finish: refreshing but not too sweet. Crafted by 5th and 6th generation father-and-son winemakers at our Maison established in 1898. Unique, luxurious package: a black bottle with silk screened labels, topped by a sleek black Champagne foil with pink accents. Where to buy Luc Belaire Sparkling Rose Wine ? Luc Belaire Sparkling Rose Wine Supermarkets & Stockists. 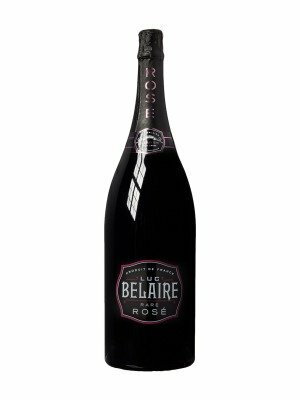 You can buy Luc Belaire Sparkling Rose Wine online in most retailers and find it in the Sparkling Wine aisle in supermarkets but we found the best deals online for Luc Belaire Sparkling Rose Wine in TheDrinkShop, DrinkSupermarket.com, and others. Compare the current price of Luc Belaire Sparkling Rose Wine in 3lt size in the table of offers below. Simply click on the button to order Luc Belaire Sparkling Rose Wine online now.